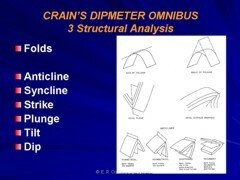 Publication History: This article is based on "Crain's Dipmeter Omnibus" by E. R. (Ross) Crain, P.Eng., first published in 2003, and updated annually until 2016. This webpage version is the copyrighted intellectual property of the author. 1. dome mountains result from the upward bending of rocks into the form of a dome. The Black Hills of South Dakota are a typical example of a naturally dissected dome mountain. 2. fold mountains consist of a series of long, more or less parallel wrinkles, or folds. The mountains of West Virginia and central Pennsylvania are good examples of fold mountains in the mature stage of erosion. This type of lateral compressional folding, whether it occurs in mountain building or on a much more localized scale in the subsurface, creates structures which may contain hydrocarbons. These are anticlines, synclines, and monoclines. 3. block mountains are formed by faulting and uplifting of angular blocks of rock. Some of the blocks are pushed and tilted at various angles into block mountains. The depressed blocks between the uplifted ones are block basins. Anticlines are the raised peaks of folds (the tops of the hills) and may be evident at the surface, although deeply buried anticlines may be covered by flat lying sediments. Synclines are the valleys between folds. A monocline is a long, relatively flat, sloping surface usually with a more or less flat plain at the bottom end and a flat plateau at the top end. Formation dip is the angle relative to horizontal at which the top surface of a formation rests. The dip direction, or dip azimuth, is the direction relative to north at which the formation dips downward. Strike is the direction of a line along the surface at right angles to the dip direction. A dome is a fold where the beds dip in all directions away from the point of folding. The axial plane may be a warped surface. The same type of forces that act on a major scale to build mountains act in a smaller localized way to create faults. The gravity, or normal, fault is caused by tensional forces. Removal of compression allows one block of the earth to move downward with respect to another. When compressional forces are exerted, a reverse or thrust fault results. In a thrust fault, pressure forces cause the hanging wall (the rock above the fault plane) to move upward and over the top of the foot wall (the rock below the fault plane). Reverse faults are similar except that there is no motion of the upper block along the top of the lower block. Movement of either wall in a direction parallel with the fault plane is called a rift or tear or shear fault. In some instances a long and narrow block drops down between two or more faults, and is called a graben. Blocks that remain raised between two faults are called horsts. The faults bounding both grabens and horsts are gravity (or normal) faults. 1. separation: the distance from one bed boundary in one block to its counterpart in the other. 2. throw: the vertical component of separation; i.e., separation measured in a vertical plane normal to the fault plane. The term 45-foot fault means that 45 feet of vertical section are missing at the well bore (if a normal fault) or 45 feet of section is repeated (if a reverse fault). 3. slip: the movement along the fault, being the distance between two formerly adjacent points. Slip can be in any direction within the fault plane; same as separation if there is no horizontal component of movement. 4. extent: a fault is limited in horizontal and vertical extent by sudden disappearance against another fault, or against an unconformity, or by gradual decrease of throw along the fault plane. In rotational faults, throw decreases in the direction of the plane of rotation. 5. correlation gaps or repeats: when a well crosses a normal fault, correlation of the well logs will show a missing section. When a well crosses a reverse fault, the same formation is crossed twice, and appears as a repeat section on the log. A reversed repeat can occur when drilling through a recumbent fold. 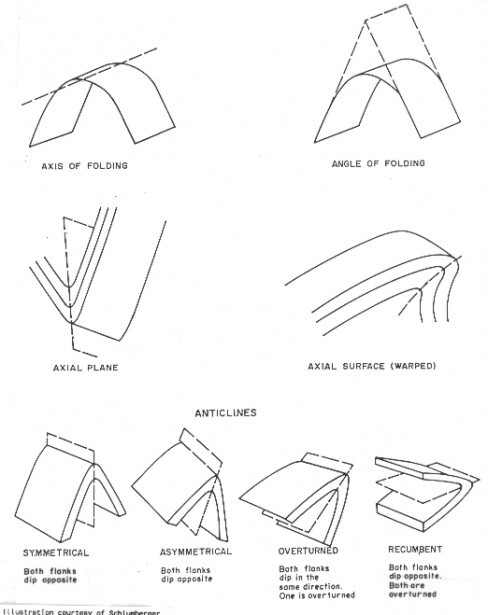 - concave folding on the downthrown block. - convex folding on the upthrown block. In certain regions, normal faulting occurs with reverse drag, or rollover in the downthrown block. In this configuration, the bedding planes dip into the fault plane instead of away from it. 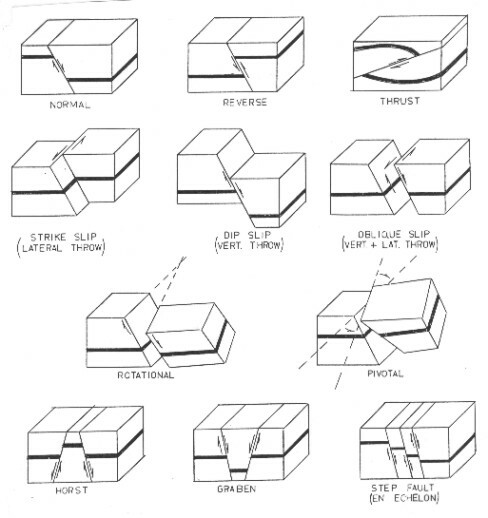 Rollover is frequently associated with growth faults; i.e., faulting contemporaneous with deposition, with greater formation thickness on the downthrown side of the fault.